At T. H Harvey Construction & Management, we take pride in our hands-on approach, consistent communication, and a commitment to delivering high-quality projects on time. Our team specializes in beautiful commercial renovations for offices, retail spaces, restaurants, and more. We understand that no two projects are the same, which is why we will work with you on your specific design, budget, and timeline of your project. Even commercial properties can vary widely depending on the industry, meaning you need a trusted construction company to handle these challenging needs. At T. Harvey Construction & Management, we will assess the type of commercial renovation that you desire and create a drawing to help you get a better understanding of the renovation. Our company never turns away any project we are given; our team will continuously seek input during the entire process to ensure the project is going according to plan. Regardless of your property type or project scope, we can tackle any project given to us. Our skilled team has one mission- to create and deliver your dream renovation. During every phase of the project, we will work closely with you. From project planning to design to execution, you’ll be informed every step of the way. We also understand that businesses need to keep running regardless of the project. For this reason, we can work around any company that must remain operational. We always plan our renovations so that they intrude very little on the day-to-day operations of your business as well as your employees and customers. First impressions are everything- this includes your commercial property. No matter the industry you're in, your commercial space should reflect the identity of your company. At T. Harvey Construction & Management, we’ve worked on all types of renovations. From traditional to modern to contemporary- we can handle any project. Whether your space is previously damaged or simply needs an update, we can improve it according to your renovation goals. 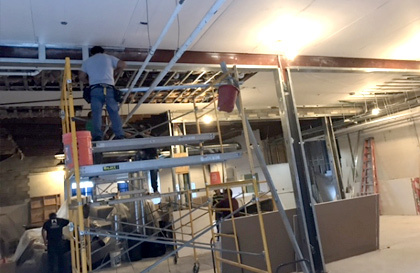 Whether you’re looking to revamp your restaurant, refresh the lobby of your building, or increase space due to occupancy- the team at T. Harvey Construction & Management will be happy to renovate your space. 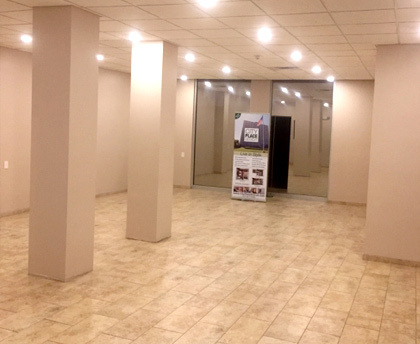 The team at T. Harvey Construction has experience with commercial renovations of all sizes-from small retail spaces to multi-story offices; we do it all! Call us at (313) 468-2560 for more information about our commercial services.